Radio amateurs Benjamin Longmier KF5KMP and James Cutler KF6RFX of the University of Michigan hope to raise $200,000 on Kickstarter for a CubeSat propulsion project. 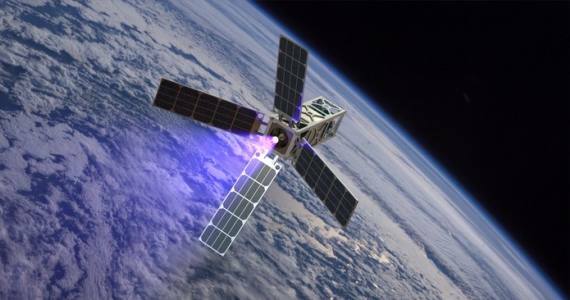 The CubeSat Ambipolar Thruster (CAT) is a new plasma propulsion system which will push small spacecraft like CubeSats around in orbit or far beyond the Earth. They aim to use the CAT plasma thruster to propel a 5kg satellite into deep space at 1/1000th the cost of previous missions. Just like a normal rocket that produces thrust from the burning and expansion of hot gases, CAT produces thrust from the expansion of a super-heated 350,000 °C plasma stream. Plasma is an ionized gas that can be accelerated to produce thrust (F=ma). The force generated by this thruster will be very low (milli-newtons) but very efficient. The engine will be turned on for long durations, accelerating the spacecraft to much higher velocities than a typical chemical rocket. First, the propellant will be injected from its storage container into the plasma discharge chamber, a quartz bottle that distributes the gas and contains the plasma. The gas is turned into a plasma by a radio frequency antenna that surrounds the chamber and launches a plasma wave known as a “helicon.” The plasma is then launched out of the quartz bottle and guided by magnetic fields from extremely powerful permanent magnets. As the plasma escapes the CAT engine, this causes an equal and opposite thrust, pushing the satellite in the opposite direction. Unlike conventional rockets, almost any substance can be used as propellant for CAT – even liquid metals or water vapor! Find out more about the project and watch the video on the Kickstarter site. This entry was posted in Satellite and tagged CubeSatAmbipolarThruster by PE0SAT. Bookmark the permalink.